It is January 24, 2019 and the record-breaking government shutdown has continued into its 34th day according to CNN. 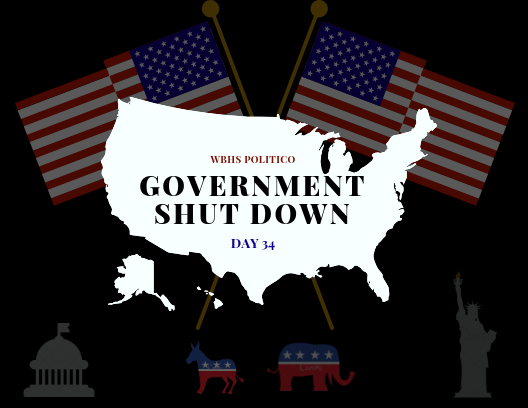 The government shutdown continues to be ongoing because the two major political factions have yet again failed to reach common ground. According to The Washington Post, a proposal by the Democrats to reopen the government until February 8th has failed in the Senate. The Washington Post also reports that Democrats in the Senate also blocked a White House backed bill that would strengthen protections for immigrants and end the partial government shutdown in exchange for 5.7 billion dollars to fund the wall that would occupy the US-Mexico border. While the two opposing bills were both blocked in the Senate it seems as if party lines are being to blur. CNN reports, 6 Republican Senators voted in favor of the Democratic proposal which failed as expected with only 52 votes in favor and 40 votes against. 60 votes are required to advance the proposal. According to FOX News, on Friday government workers affected by the partial shutdown are set to miss their second paychecks, including tens of thousands of members of the US Coast Guard which falls under the Department of Homeland Security. Many of the people affected by the partial shutdown are not going to be able to pay their bills and some are even facing eviction if the government does not find a solution quickly.